I was co owner of ‘Djinn’ aka ‘St James’, a quick, light, Italian J24, or so I was told by a Mr Cooper when he sold her to me. And so she proved but she was tatty inside – i.e. you didn’t touch anything unless you enjoyed extracting glass fibre splinters all day. Sorting it would be a grotty job and we turned a blind eye until ‘CHAOTIC’ suddenly became available. An Aussie J, rumour had it she was built for Bashford himself; she was nicely flo coated inside and very clean, but we didn’t want 2 boats. A solution appeared whenthe young owners of Westerly J ‘Just the Tonic’ approached us, they wanted to upgrade but couldn’t afford ‘Djinn’ until they sold theirs. Talking it over one Wednesday evening after racing with arch rival, Dave Cooper ‘Jawbreaker’, we struck on the idea of swopping the Js’ and a cash settlement. The problem now was I didn’t want another J to look after by myself so Dave suggested he would come in with me if I could find two more partners to co-own and maintain the boat. This way we could introduce new owners to J racing at minimum cost. We would base the J at Saltash S.C. where I was a member and race in their Thursday series. I eventually persuaded Chris Randell and Simon Beeby that this was an offer they couldn’t resist and so the deal was done. A win, win situation. I got my new boat, the lads upgraded, Saltash got a J and the class had two new sailors. 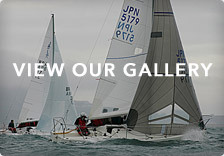 SSC now had 4 Js’ racing in their IRC fleet. The UK Association then offered the Plymouth class ‘Nitro’, a training and promotional Westerly. I accompanied Dave in his wheezy old Range Rover and we found her in a barn looking very smart, we were most impressed but as we werepreparing to hitch up we were firmly informed that isn’t‘Nitro’, she’s round the back, we had been about to take ‘Hitchhiker’, Oops! Having got ‘Nitro’ back to Plymouth we based her in QAB with the intention of bringing the Plymouth University Sailing Club into Wed night J24 racing. This worked reasonably well until their summer break, then we never saw them again. This was an expensive lesson for the local class who were funding the running costs. The lesson is “if it’s free it has no value”; clearly we needed more commitment so I approached Saltash to see if they were interested in the J for their cadets. It was agreed that if we could provide a responsible person to look after her they would assist in finding moorings and storage. We didn’t know any responsible people but while we were considering this conundrum a big boat sailor stepped in. He would agree to look after her if he could race her Thursdays and the cadets could have her for their training on Fridays, we had the 5th J. Number 6 arrived with “Coops” making a last minute “silly” bid in a silent auction for ‘Red Alert’. What a bargain, not so silly after all. He now owned 2 ¼ Js’, the only problem is he now likes to be addressed as Commodore Coops. When we were told that another class J ‘JoJo’ was lying idle in Weymouth “Commodore Coops” dusted off his wheezy steed again and Saltash had J number 7. It was clear the J’s were here to stay so we asked Saltash to extract the J results from IRC fleet. The club went one better and gave us our own start; result, we could now focus on battling other J’s without being rolled by big boats. In the meantime my co–owner, Parky, was heading for the USA to marry Kristin and begin his new life. He now sails on a J24 in the Arizona desert??? 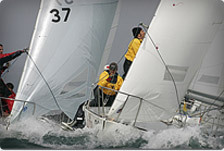 I was intent on cutting down my sailing, again, so ‘Chaotic’, aka ‘Skilled Services’ was sold into the Dartmouth fleet. For this I was roundly condemned by a drunken reveller at the Saltash Dinner Dance. To protect the guilty I will refer to him only as CW. Despite my actively marketing the boat locally CW claimed he would have bought her if he’d known she was for sale. These words were to come back to haunt him when ‘Chaotics’ new owner was unable to take her. I challenged CW to make good on his claim, he did and Saltash had J number 8. The moral of the story is, drink in moderation around J sailors. In SSC it was increasingly clear that the J24’s was the place to be, we were having fun and good close racing, there was a buzz in the club and it was affordable, we were being noticed by other classes. The NHC system helped further our cause, disillusioned racers began deserting and joining us. Out of the blue Thor and Jam came into the club, Hooray we had hit double figures. 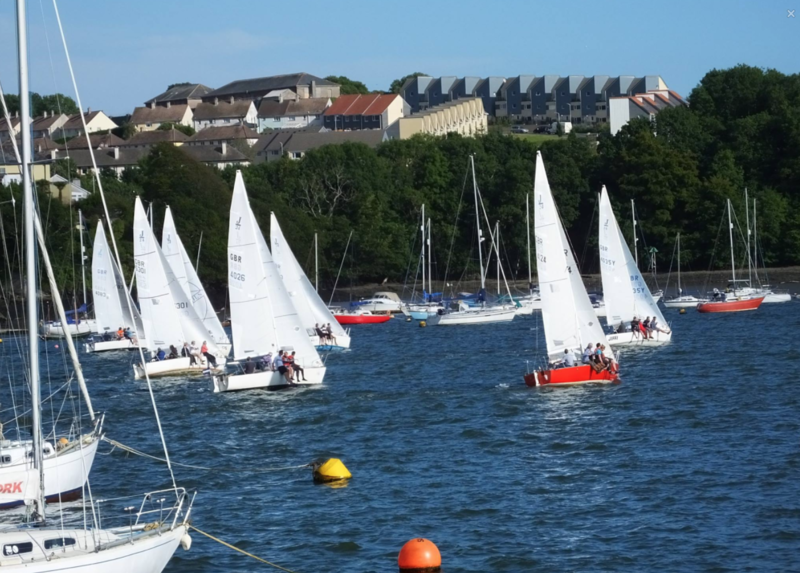 So where are we now with the Saltash J fleet; well the old J’s have had a new lease of life and they are back where they should be, fleet racing. SSC now boasts one design class racing; ‘new’ boats, new members, new youngsters mean race night is a busy affair both on and off the water. The cadets have an ideal platform for keelboat training and the UK J24 Association has new members. Saltash is now tailoring events around the J24, Chris Randall organised this year’s Commodores Cup comprising of match racing in J24s. As new owners become more experienced they are looking further afield and doing bigger events. Boat number 11. JoJo is being relinquished, Sam liked it enough to go and buy one of his own. We currently have a couple of names in the frame but as Groucho would have said, “if they want a J24 they clearly aren’t a responsible person”. Thanks go to Stig Mcdonald (Jeli) for his assistance with the boats and technical input, and to Dave Cooper (Jawbreaker and Red Alert) for his optimism, enthusiasm and willingness to go get sad old Js wherever they may be. Downsides, feeling smug during the endless disagreements over handicaps, we head to the bar and row instead over who’s round it is. Sailing on Red Alert, a boat full of helms.